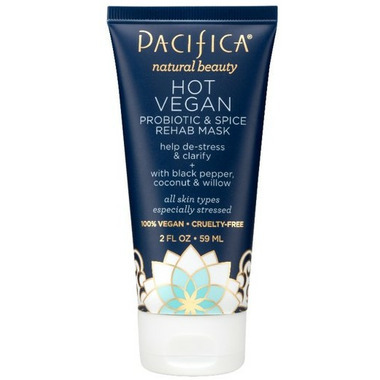 Pacifica's Hot Vegan Probiotic & Spice Rehab Mask is a gel blend that goes on weightlessly. Contains Ayuvedic herbs, probiotics, and coconut water to help purify, energize, decongest, depuff and rebalance the health of stressed skin. Black pepper creates heat to loosen impurities, blackheads and blemishes while ginger stimulates. For all skin types, especially stressed. 100% vegan and cruelty-free. Ingredients: aqua, glycerin, aloe barbadensis leaf juice, sclerotium gum, algin, salix nigra (willow) bark extract, zinger officinate (ginger) root extract, elettaria cardamomum (cardamon) extract, piper nigrum (black pepper) fruit extract, cocos nucifera (coconut) water, lactoccus ferment lysate, sorbitan, oleate decylglucoside crosspolymer, phenoxyethanol, ethylhexylglycerin, parfum (all natural). I'm not sure how i feel about this mask. It was not very warming. Maybe for like a minute it was warm? It was hard to tell. After washing it off, my skin does feel detoxified, but not stripped or dry. I do like it, but I'm not sure if I would recommend.. I really wanted to love it, but it has not been life-changing thus far. This mask only felt warming for the first few seconds that it was on my face. I also found that I would have to apply a decent amount to experience this feeling. After washing it off, my pores seemed more open (loosening impurities/blackheads as mentioned in the product description). I had no adverse reactions to this, but don't know if I could justify spending this much money on such a small product (I do like that it's vegan though). Overall, did some of what it was described to do, but nothing to rave about. This mask is different than anything I've used before. I didn't need that much for application as it is a bit runny. Once on, it feels a little warm and after about 5 minutes, feels like it's drying on your face but it's not at all. Left it on for 15 minutes and then washed it all off and was very pleased with the results. It did a good job of cleaning blackheads and dead skin off and my skin felt amazing. Really love this product! I think masks are great to use once a week as an extra boost to take care of your skin. This is a perfect option for that. I have sensitive skin and I can't use products with strong fragrance. This mask is gentle, non-abrasive, soothing and clarifying. It smells wonderful, but the scent is delicate and not overwhelming. I highly recommend it for anyone with sensitive skin. I am in love with this mask! I use this on my face in the shower every 2-3 days and my skin has been so much clearer. It looks like my pores are actually minimized as well. I've noticed my skin tends to not be as oily, but that could be from my new toner or moisturizer as well. The mask is gentle and non-irritating to my sensitive skin. I need to buy another soon before I run out! My skin really likes this! I have very sensitive, allergic skin and this mask soothes it, minimizes pores and makes me look glowy. Magic. I absolutely love this product! It smells wonderful and leaves your skin feeling soft and clean. It's a little runny (not like a typical mask), so be careful when opening it. The texture is gel-like and runny/watery. It's a texture that i'm not quite used to in a mask. I had no reactions to this at all, and my skin is pretty sensitive. I have acne-prone skin with active acne, and this seemed to help diminish my acne the next morning. I like that it's natural and has probiotics in it. It's very gentle, so I like that I can use this multiple times a week. It's worth a try I would say! I only just started the bottle, so perhaps I will write another review when I am finished.